The No. 1 sign you need a new deck is rotting or decaying wood. Aside from the physical signs of such damage, you may notice boards that start to feel soft or spongey underfoot. These are sure signs that deck replacement is in your (near) future. 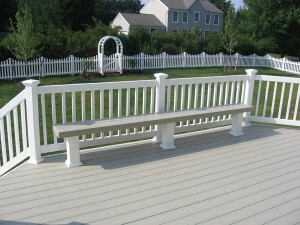 If your railings appear to be weak or excessively loose, it may be time to consider a new deck. Your railings play a very important role: safety. This is especially true for decks connected to the second story of homes. If the ledger board – the board that attaches the deck to your house – begins to come undone, deck replacement is a must and should be done AS SOON AS POSSIBLE. However, the best way to tell if it is time for a total deck replacement is to have a professional come and assess the condition of your deck. If you are not ready to completely replace your deck, Re-Decking may be an option. We will inspect your existing deck to see if re-decking is even an option. Re-decking takes the existing frame and replaces only the deck boards. It’s like a facelift for your deck! If you have any questions about Deck Replacement, please contact Mid Atlantic Deck & Fence (MAD Fence) today by clicking here or calling 1-800-833-9310. We proudly serve Anne Arundel, Baltimore, Howard, Montgomery and surrounding counties.